Please find below a plan view of a new incident for you to evaluate your ‘size-up’ skills. The above building is an American (USA) three storey mid townhouse, commonly known as a back to back, which means that the only access and windows are at the front as shown above. Upon arrival if you were the Incident Commander (IC) and were confronted with the front door on the first floor (ground floor – UK) open and ‘hot’ black smoke moving out towards the outside approximately in a half way position in the doorway and black smoke showing in all the windows, with one of the third floor (second floor – UK) windows open and ‘hot’ black smoke emitting from the windowsill upwards. And an injured, conscious and slightly confused or disoriented occupant is found on the ground at the front of the building having seemingly jumped from the third floor (second floor – UK) open window. This occupant indicates there is still someone in the house. The single staircase leading to the upper floors starts at the back of the first floor (ground floor – UK) on the right hand wall looking in from the front entrance door. Additional information received en route to the incident by fire crews from dispatch was that the “house was full of smoke”. Upon arrival the fire crews are informed by dispatch that there is a resident on the third floor (second floor – UK). 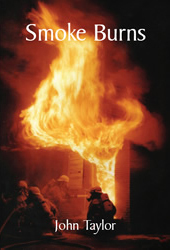 ‘Size-up’ the incident and diagnosis the stage of the fire by ‘reading the fire gases’ and using ‘MITCH’. Where is the seat of the fire? Where is the ‘air supply’ coming from feeding this fire? What stage is the fire at? How would you as IC hypothetically deploy your crews? Feel free to e-mail us your deployment for consideration and debate and if you’d like us to post it on the web site. Please give us your permission to do so and if you’d like it posting anonymously that is not a problem. John Taylor 16 February 2008.